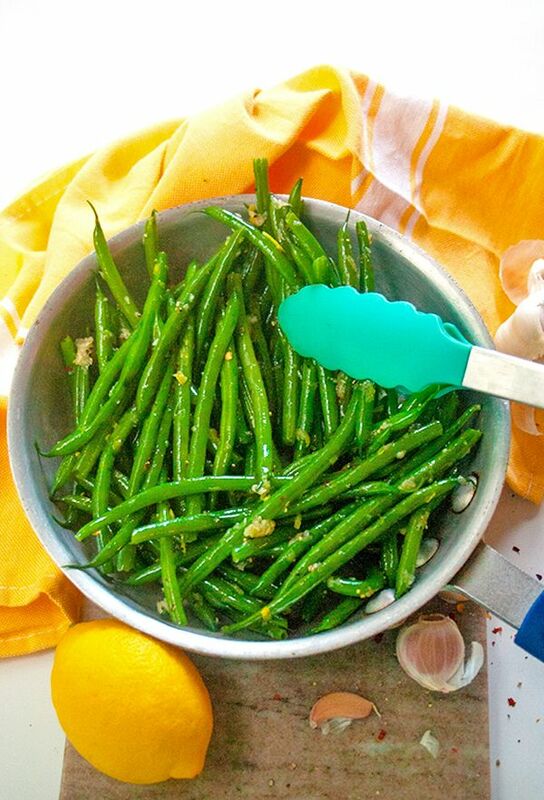 These Quick and Easy Garlic Green Beans are the perfect 15 minute side dish. They’re sweet, crisp and a little spicy! A great option for Fall dinners. When I was a kid I loathed broccoli. As an adult, I still have a love hate relationship with broccoli, in that I love to hate it. To combat this my mom used to cook string beans A LOT. This garlic green bean recipe is pretty similar to what she used to make. This was by far one of my favorite sides growing up and for good reason! With all the garlic and lemon zest on these babies, you’re gonna want to have your spare spoon (or bread!) ready to scrape up all of the leftover goodies at the bottom on the pan. Don’t add them to boiling water If you add the green beans to a pot with a rolling boil, they will lose that bright green color. You want to fill a deep skillet (not a soup pot) with warm water, turn on the heat and then add the string beans to it. Be sure to salt the water It’s so simple but so important. Sure, green beans in season will be nice and sweet, but a pinch of salt will seep into the beans and bring out their natural sweetness even more. Maintain some crunch factor I’m convinced that over-boiled green beans (or veggies of any kind really) are the reason why people are skeptical of veggies, even as adults. They’re haunted by those darn mushy beans of the past! The green beans should only cook for 5-7 minutes. 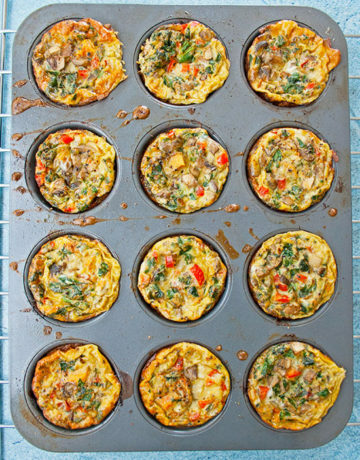 Tip: Take one out of the pan and break it in half; it should have a slight crunch and should still be GREEN! Rinse with cold water This step is crucial! When the green beans are done, strain them and rinse with cold water until there is no longer steam coming off the beans. The cold shock will keep the the green beans from overcooking and turning gray…no one wants gray green beans! I think we’re hard wired to have a plate composed of meat, carbs and maybe a small section of veggies. 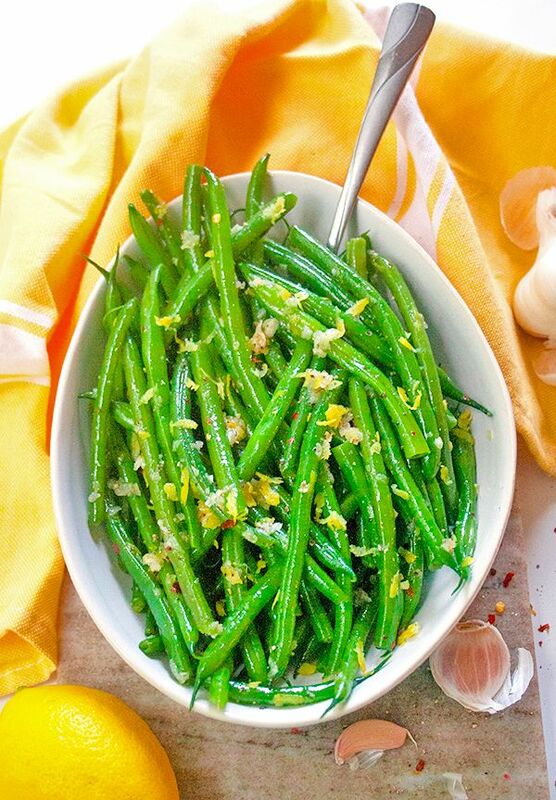 These garlic green beans however are flavorful enough to take up half of the plate. I promise you won’t miss your pasta, potatoes or bread. P.S. 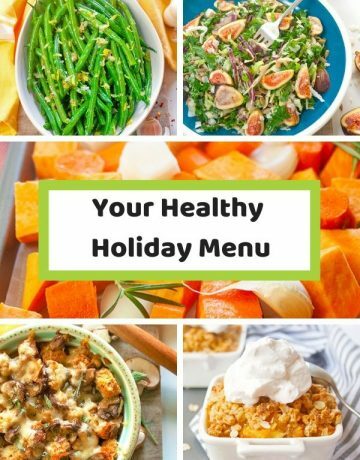 if you’re looking for a more balanced and healthier plate composition, check out the ChooseMyPlate website for all types of helpful guidance. These garlic green beans are super quick and versatile too. I know the green beans are the star here, but you can really use any vegetable that works well steamed. Actually back when Tim and I were dating, we went to visit his family and we cooked dinner for his parents. I remember being super nervous about everything tasting good to try and impress them. One of the sides we cooked for them was garlic asparagus. The asparagus were coated in garlic and lemon zest, just like these green beans and worked really well as a replacement for green beans. Other veggies you could use instead of string beans are: asparagus, snap peas, wax beans or sliced bell peppers (no boiling needed). For something as simple as a 5 ingredient side dish, you need to make sure your few ingredients pack plenty of punch. Garlic: Because everything tastes better with garlic! Tim and I had garlic ice cream once at a food festival at it was pretty tasty so…point proven! Lemon Zest: For a pop of color and freshness! Red Pepper Flakes: A little spice makes everything nicer! P.S. To make these perfectly every time, you’re gonna want to have a sturdy colander, a deep skillet and a microplane for zesting. What main dish goes good with these sauteed string beans? Ready for a new side dish to brighten up all your meals? 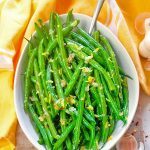 These Quick and Easy Garlic Green Beans are the perfect 15 minute side dish. They're sweet, crisp and a little spicy! A great option for Fall dinners. Add green beans to a large deep skillet. Turn the heat on the medium-high heat. Cover the green beans with warm water until they are just covered. Add salt to the water and cook 5-7 minutes until the green beans are tender but slightly crisp. 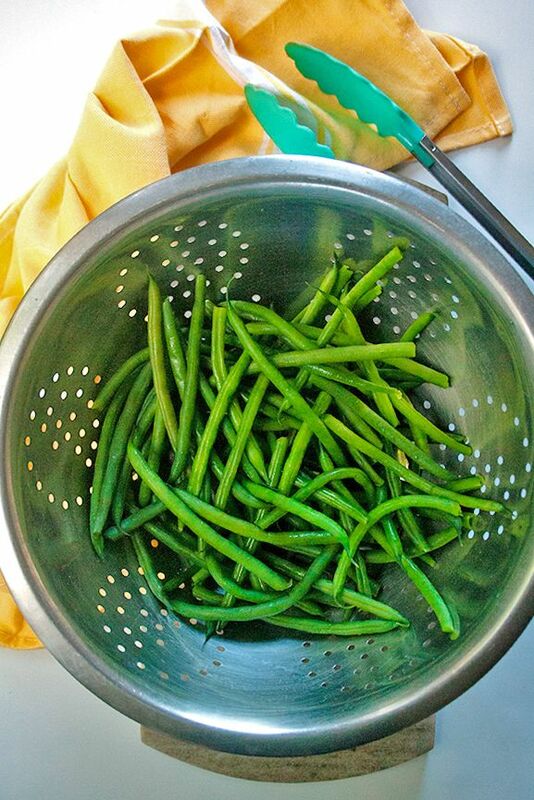 Strain green beans in a large colander and run cold water over them until they are no longer steaming. Heat a a large deep skillet to medium-high heat. Add olive oil, cooked green beans, garlic, lemon zest, red pepper flakes, salt and pepper to the skillet. 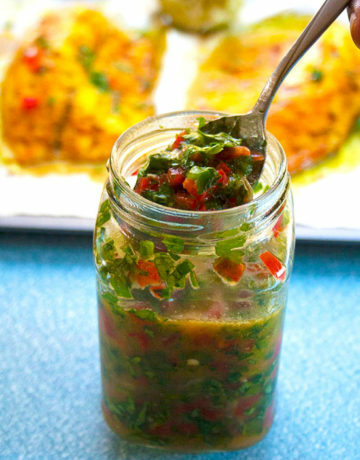 Toss with tongs continually for about 2-3 minutes, so that the garlic and zest doesn't burn. Enjoy!